Loomstate !Act Natural! 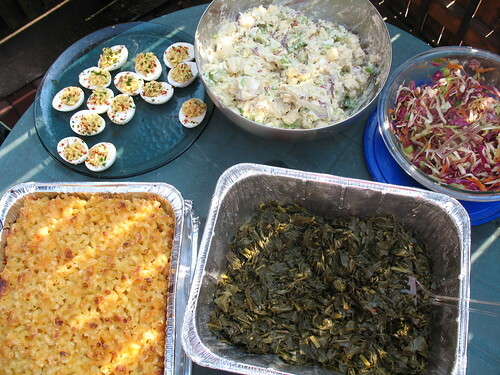 Blog: Recipe for a Great Potluck! Recipe for a Great Potluck! Potlucks seem to be a popular topic these days. We got word of PBS' Food, Inc. screening and potluck party for gifts, then Not Eating Out in New York brings us a Q&A with Bikeloc, two cyclists holding potlucks around the nation. What better way to bring together friends and friends of friends of friends than with a potluck? The Food, Inc. screening starts on April 21st and will screen for that week, and Bikeloc is kicking off with a fundraiser in Brooklyn on the 11th. Your local farmer's market - to gather the freshest ingredients for your signature overcomplicated dish. A comfortable, black tee - to get messy in the kitchen with and look good while doing it. Food storage containers - to bring the food to the potluck and to store the leftovers.